Learn more about the SIG Sauer x-Five ASP in Tom Gaylord's Airgun Academy Blog. 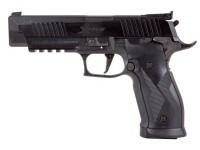 Sig Sauer continues to improve on the design of pellet pistols for some of their most celebrated firearms. As part of this new standard for CO2 air pistols, SIG Sauer has created a 20rd belt fed CO2 version of the 226 X-Five ASP Pistol. The 20rd magazine is where the X-Five ASP really shines through. 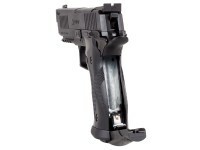 This design allows for 20 semi-auto shots be to be taken before reloading while other pellet pistols use small capacity rotary mags that must be reloaded after every 6-8 shots. Once you load up your magazine and the CO2, you can shoot your pellets downrange at speeds up to 430 fps to shred paper targets and blast down soda cans. 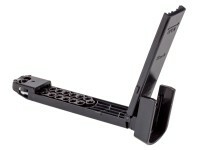 While designed for pellet shooting, you can also load up BBs. For even faster-paced shooting sessions, you can further customize the gun with lasers or flashlights mounted to its Weaver/Picatinny accessory rail. With this many shots, this pistol is great for hours of plinking fun and a welcome addition for owners of the real steel SIG 226. If you like CO2 replicas with more shooting and less reloading, this is the air pistol you've been waiting for! Things I would have changed: Accuracy could be better. Pellet feeding is a little lacking. I had hoped to set up a little action pistol course but accuracy is lacking for precision shooting. I guess My expectations were unrealistic for this price point, I had read some reports that had my hopes up. What others should know: The first one I got would not get more than 8-10 shots without a jam. The pellet would not properly feed into the barrel. I would have. 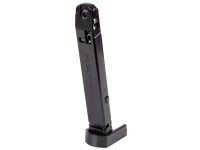 To use a cleaning rod to push the pellet back into the mag in order to remove the mag. This first pistol's accuracy was horable!! I think the mis feeds damaged many pellets that did in fact feed and shoot. I had two other mags to try with the same results. I exchanged for another X-Five. Great service from PA, thank you for that. The new gun accuracy is much better although not what I was hoping for (3" group at 10 yards) so I'm disappointed in the accuracy, I have some other quality pistols and shoot reasonably well, my experience was not as good as the reports I have read. The new gun has only jammed about 3 times in about 300 shots. Be sure to have a dowel of soft metal cleaning rod to push Jamed pellets back into the mag, it gets stuck partially in the barrel and mag at the same time so the mag can't be removed. Things I would have changed: After reading other review's, get the issue fixed with the magazine hanging up,also the same problem, I had . 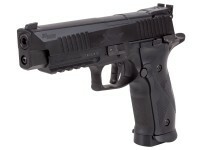 Things I liked: The first thing i want to say about this pistol is that it is a beast. It is huge and heavy and nicely finished. My pistol shot low out of the box but the rear sight is adjustable and quite nicely finished. This is a swell air gun for sure with a couple of quirks that set it apart from the others. Things I would have changed: I understand because of the mag system that they couldn't have an ejection port. That kind of bothers me and the interior barrel is out all the way to the end of the slide and hence it looses that real look that so many other air guns have if you had to point it at someone being bad. Over all i like the pistol a lot but i consider it more of a training tool because of its size and weight. What others should know: It took awhile to get used to the new style of magazine. I bought two extra mag's with the pistol and have run three sessions using all three one after another. I easily got 80 shots thru it on a tank of gas. I had read that these mags were prone to missing a pellet from time to time because of the method by which it works. I think i have had 1 pellet not fire out of the three mags with each mag used three times thru the series. It seems to work pretty well so far. As for the trigger that took a while to get used to. You have to pull it back until you feel the stop and from that point slowly squeeze the trigger. I find shooting 20 rounds at a time to be somewhat taxing to these old arms of mine but i like the weight as it is working the muscles more. The pistol will out shoot me by a mile and once you get the hang of the trigger and get used to the weight you will have good results. But it really is heavy. Has anyone found a successful trigger modification for this gun. When the gun isn't loaded, the trigger pull is just over 2 lbs but the minute you load the mag up it jumps to over 8 lbs! I realize that the entire first part of the pull is advancing the magazine and that likely cannot be improved but why the huge difference in break weight when the mag is loaded? Makes no sense to me and I'm hoping someone has found a way to improve it. 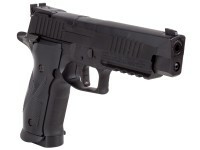 Is this gun actually manufactured by Sig Sauer, or should I spend my money on the Cybergun 4.5mm BB version? My understanding is that you should NEVER shoot steel BB's down a rifled barrel because the the steel BB's will damage the rifling of the barrel, or has Sig formulated a new metallurgy (Sig-Steel) for their airgun barrels? 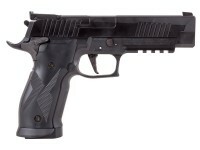 The gun is made in Japan for Sig Sauer. The Cybergun Sig stuff was just licensed and not an actual Sig product. It's not recommended to shoot BBs out of a rifled barrel because over time it can degrade the rifling, does that mean that you cannot do it, no. The gun will work with both. I would stick with pellets for the most part, but shooting BBs out of it every so often isn't going to kill the pistol.